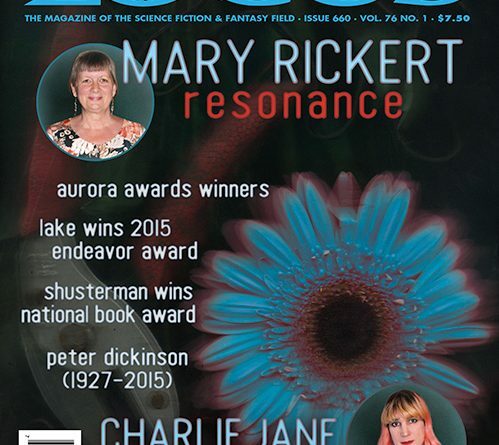 The January issue features interviews with Mary Rickert and Charlie Jane Anders, a new column by Cory Doctorow, an international report from Brazil, and reviews of short fiction and books by China Miéville, Robert Jackson Bennett, V.H. Leslie, Stephen King, Nancy Kress, and many others. Meeting Infinity, Jonathan Strahan, ed. ; Future Visions, Jennifer Henshaw & Allison Linn, eds. ; The Atlantic Council Art of Future Warfare Project: War Stories from the Future, August Cole, ed. ; Stories For Chip: A Tribute to Samuel R. Delany, Nisi Shawl & Bill Campbell, eds. ; The End Has Come, John Joseph Adams & Hugh Howey, eds. ; Ecotones: Ecological Stories from the Border Between Fantasy and Science Fiction, Andrew Leon Hudson, ed. 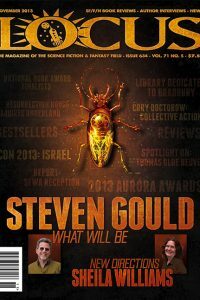 Asimov’s 12/15; Gypsy Plus…, Carter Scholz; F&SF 11-12/15; Analog 12/15; Clarkesworld 11/15; Tor.com 11/15; Future Visions, Jennifer Henshaw & Allison Linn, eds. ; The Mammoth Book of Dieselpunk, Sean Wallace, ed; Ghost Signs, Sonya Taaffe. This Census-Taker, China Miéville; The Lost Time Accidents, John Wray; Beneath an Oil-Dark Sea: The Best of Caitlín Kiernan, Volume Two, Caitlín Kiernan. City of Blades, Robert Jackson Bennett; The Rising, Ian Tregillis; Skyborn, David Dalglish; The Builders, Daniel Polansky. Skein and Bone, V.H. Leslie; Painted Monsters and Other Strange Beasts, Orrin Grey. The Bazaar of Bad Dreams, Stephen King; Let Me Tell You, Shirley Jackson; The Face of the Earth and Other Imaginings, Algernon Blackwood; Lovecraft Country, Matt Ruff. The Aeronaut’s Windlass, Jim Butcher; Gatefather, Orson Scott Card; Walk on Earth a Stranger, Rae Carson; Mystic, James Denzel; Alliance, S.K. Dunstall; Court of Fives, Kate Elliott; The Rest of Us Just Live Here, Patrick Ness; Newt’s Emerald, Garth Nix. 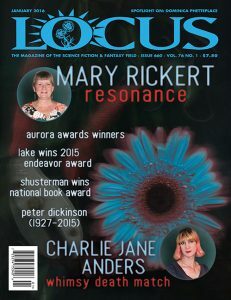 The Best of Nancy Kress, Nancy Kress; Wake of Vultures, Lila Bowen; Starflight, Melissa Landers; AfroSF v2, Ivor W. Hartmann, ed. The Heart Goes Last, Margaret Atwood; Walk on Earth a Stranger, Rae Carson, The Traitor Baru Cormorant, Seth Dickinson; Bookburners, Max Gladstone, Margaret Dunlap, Mur Lafferty & Brian Francis Slattery; Tremontaine, Ellen Kushner, Alaya Dawn Johnson, Malinda Lo, Joel Derfner, Racheline Maltiese & Patty Bryant, The Shepherd’s Crown, Terry Pratchett; Magnus Chase and The Gods of Asgard: The Sword of Summer, Rick Riordan; Two Years Eight Months and Twenty-Eight Nights, Salman Rushdie.